Iron Giant Vinyl Vinimates Figure | Nerd Much? Though The Iron Giant came out in years ago in 1999, it still impacts our hearts and minds today. Let this Iron Giant Vinyl Vinimates Figure serve as a reminder that we are who we choose to be and no matter how powerful technology can become, it is not always necessary to treat it as a weapon. 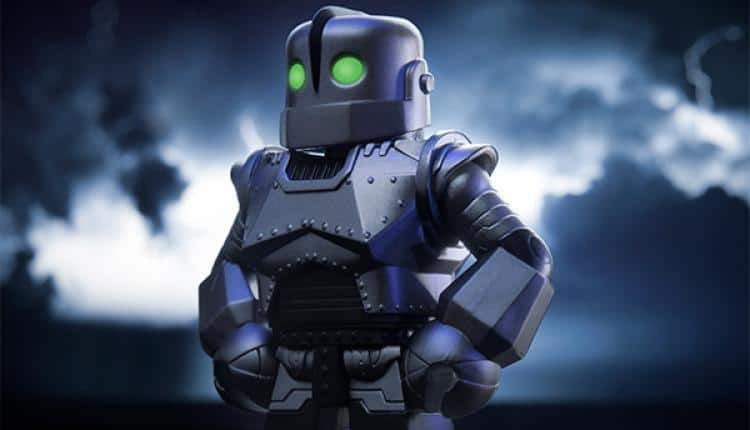 The Iron Giant Vinyl Vinimates Figure boasts a metallic paint job, along with glow-in-the-dark eyes. He is not as long-limbed as his movie counterpart, in The Iron Giant, or in Ready Player One, he is more stocky and short. The reason for this change is likely to give him more stability so he won’t constantly fall over as he stands on your desk or shelf. You can also turn his head, but nothing else – make sure he’s really watching you work. The story behind the Iron Giant is both a complex and very simple one. It is complex in terms of the context: set in 1957 just as the US and Russia are locked in the Space Race to get to the moon. Russia just launched Sputnik, the first satellite to successfully stay in orbit around the Earth. With the Cold War still going strong, tensions are very high between the two nations. Sputnik was thought to harbor a telescope to spy on the US, or worse still, nuclear missiles aimed straight at America. The Iron Giant landed in the middle of this, making for dangerous reactions from the nearby military and government agents. However, the story is also simple. Nothing more than a boy making a new friend and learning you don’t have to be what the world tells you should be – you can be whoever you want to be. It is your choices that define you, not other people. The Iron Giant tells a heartening tale, and what better way to remind yourself of it than the Iron Giant Vinyl Vinimates Figure. He will stand solidly on your desk as you work towards being Superman.